Quality: Excellent, 4:3, Tv logo. 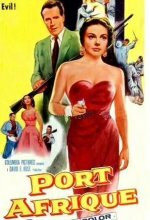 Rip Reardon, ex-Army flier, returns to his home in French Morocco and finds his wife dead, and he suspects she has been murdered. Police Colonel Moussac insists she committed suicide. Rip begins to suspect not only his friends but also a mysterious brunette, Ynez, a Casbah night-club singer with whom he begins to fall in love. Repeated efforts to kill Rip are made but he ultimately finds the evidence which sends him gunning against the killer...but is he mistaken?